The Budget SLP: Who is Eating? - Teach pronouns and more with this free download. Who is Eating? - Teach pronouns and more with this free download. 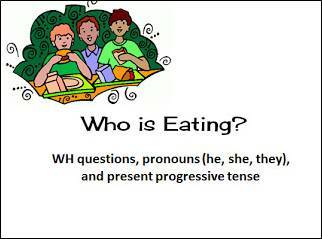 Practice WH questions, pronouns, present progressive tense, and increased phrase length with this simple PowerPoint. Click here to download "Who is Eating?"